Single Kayaks: $25 for first hour – $35 for 2 hours – $45 for 3 hours – $60 for 4+ hours. Family/Double Kayaks: $35 for first hour – $55 for 2 hours – $75 for 3 hours – $90 for 4+ hours. Stand-Up Paddleboards (SUPs) Hire Prices: $30 per hour. 1-hour SUP lesson is $50 per person. To reserve one or more of our kayaks or SUPs, please fill in the Easy Kayaks Rental Booking form below. When booking your kayak hire online, please book at least 24 hours beforehand. We accept walk-up customers as well; however, kayak hire is always subject to availability. You can always call us at 0412 098 673 to double check availability. Dec 27 to Jan 20 – 9:00AM to 5:00PM (dependent on weather conditions). Please note: Due to liability reasons, we do not allow the sharing of our craft beyond their capacity, so please make sure you book for the correct number of people. 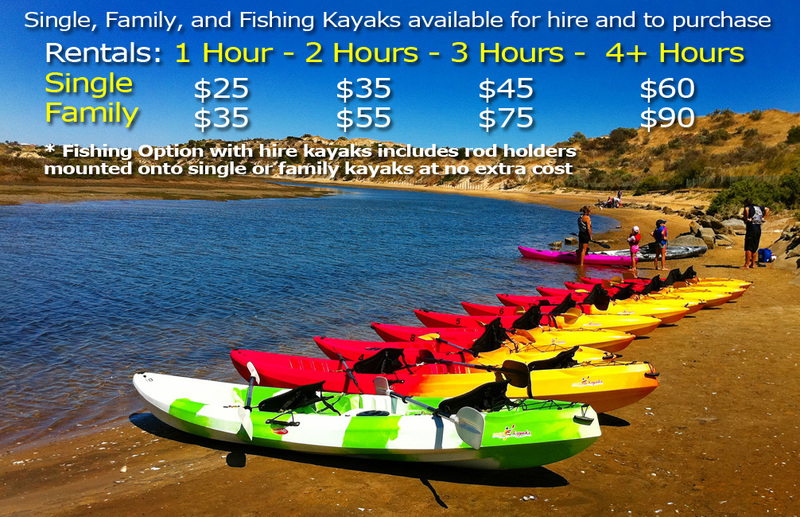 Thank you for your interest in hiring our Easy Kayaks fleet of sit on top single, family and fishing kayaks. Please select your craft, intended date and time of hire then enter your contact details in the form below. If necessary, we will call you to take your rental payment over the phone using our EFTPOS machine, and when you arrive at our hire centre, we will issue your printed EFTPOS receipt. Our kayaks can be fitted with centre fishing rod swivel holders. Please let us know how many kayaks you need equipped with fishing rod holders. Each person in your party will need to sign a release form before taking to the water. Please enter the first and last names of those that will be accompanying you on your hire date. If there are any children in your party under 10 years of age, please identify them so we can suggest the best combination of kayaks for them. Children under 10 years of age in a single kayak must be accompanied by an adult at all times. Those under 8 years of age will need to be in one of our family kayaks with at least one adult accompanying them. Please also identify any kayakers under 18 years of age as they must have their hire agreement signed by a legal guardian or parent and have an adult present on the water with them at all times. Coupon * Please select coupon deal NoneEasy Kayaks Gift CertificateOnline voucher (Living Social, Cudo, Ouffer, etc).